Presidents of Parliaments of Cyprus, Greece and Egypt are expected to hold their first meeting before the end of the year, in the framework of the parliamentary dimension of the trilateral cooperation scheme between the three countries. The issue was discussed during a meeting on Wednesday, in Nicosia, between House President Demetris Syllouris and a delegation from the Foreign Affairs Committee of the Egyptian Parliament. The delegation comprises of its President, Tarek Radwan, and members Mohamed Elorabi, Ahmed Weal El-Μoshnib and Hamdy Bekhit. According to a House of Representatives press release, they also discussed a forthcoming visit by Ali Abdel Aal, the Speaker of Egypt`s House of Representatives. 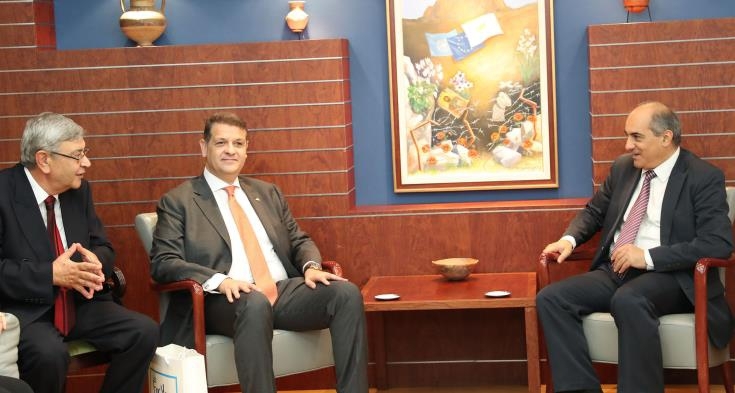 Syllouris referred to the historic ties between Cyprus and Egypt and noted the prospects for cooperation and for further developing relations. Radwan underlined from his part the willingness of the Egyptian side to further develop inter-parliamentary relations. The members of the Egyptian delegation also referred to the challenges that need to be tackled jointly, underlining Cyprus’ role as an EU member state. They were also critical with regard to Turkey’s behaviour in the region in general and vis-à-vis Cyprus in particular. The two sides also discussed ways to further develop their cooperation on a number of areas, including education and the environment, the press release concludes.